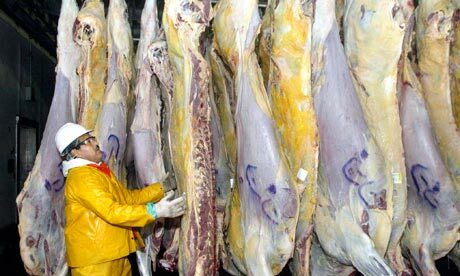 Netherlands - A majority of senators in the upper house of parliament voted on Tuesday not to ban the ritual slaughter of animals. The draft legislation was introduced by the pro-animal PvdD in the lower house in June 2011 and passed by a large majority of MPs. It first went to the senate last December but was voted out. At the time, party leader Marianne Thieme blamed the failure to get it through the senate on ‘an enormous lobby’ by religious groups. She vowed to start working on a new law. It is this new legislation which has now lost the vote for a second time in the senate. Most of the major parties voted against, saying it went against the law on religious freedom. do they still have the law that the shochet needs to stun the beheima if it is still alive after 30 seconds? Who is this stupid woman? Why can't someone just debate the bimbo and demonstrate who she is? Would the BBC cover it? This event took place in Holland - not in the United Kingdom. Why, therefore, do you think the British Broadcasting Corporation should "cover it"?